This is a reply to a comment on the Ecosystem Restoration Camps GROUP seeing that they allow our “shares” but blocked our replies to comments. 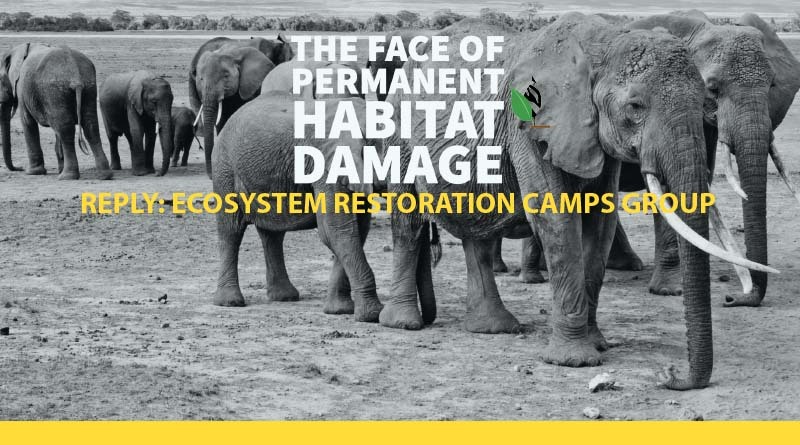 Once a population becomes “excessive” (too many elephants for the habitat to sustainably carry) it starts a spiral of habitat degradation; loss of species diversity (plant and animal species become locally extinct); and the end result is the creation of a desert. Sorry, people, we have to remember that the habitats have been destroyed by humas first. then these creatures did not have enough space anymore. so we have to recuperate these systems and help them to survive. what about permaculture recuperation of all that area soonest. lets join forces and go ahead! The Kruger habitats were not “destroyed by people” – they were destroyed by too many elephants (beyond the carrying capacity of the habitats). So there is a high degree of human culpability in this conundrum (lack of adequate elephant culling over many years). Wildlife management is the action that man takes to achieve a man-desired objective – and, in this case, the most important man-desired objective is to maintain the species diversity of Kruger National Park. The elephants of Kruger – under truly natural conditions would have long ago dispersed into less-utilised habitats that surround the current “hub” of their population distribution (Kruger National Park). That dispersal has not been possible because of fencing and dense human occupation all around Kruger. Elephants will not take up residence in any habitat where the human population is denser that an average of about 15 people per square kilometre. And this state of affairs will not change. It can only get worse. So where does this leave us in pursuance of our man-desired objective? When the natural woodland habitats have been so totally destroyed – by too many elephants over far too long a period (since the mid-1950s) – what is the option? Everybody needs to know that the top canopy trees in Kruger have been reduced in number (because of their being too many elephants in Kruger) by more than 95 percent. That is right – there are now 95 percent fewer big trees in Kruger National Park than there were in the mid-1950s. And THAT is causing – no matter what anybody else says – severe biological diversity loss. This is irreparable damage that nature (without help) can no longer fix. So what is required? In the immediate and first instance, what is required is a MASSIVE reduction in the elephant population numbers. And that reduction – NOW that the habitat damage is so perilously advanced – will have to be large enough to create conditions that will allow the habitat to recover. The dimensions of this vital exercise is something the South Africa’s people need to understand. So, you are exactly right when you say: “We have to recuperate these systems and help them to survive”. Such intervention is now inevitable. The first step, I suggest, should be to collect and distribute tree seeds inside Kruger National Park – bags and bags of the seeds of selected species (like the secondary pioneer tree species Acacia tortillis (Haak & Steek) – because without such re-seeding, there can be no recovery of the now totally destroyed woodland. Some such solutions are still possible and they WILL work. So I would encourage other people to take note of your last sentence: “Let’s join forces and go ahead.” If we don’t start anything – a movement that will make South Africans aware of this problem – and how it can be remedied – NOTHING in Kruger National Park is going to change. The conditions will just get worse and worse – until Kruger becomes a desert! This is exactly what the TRUE GREEN ALLIANCE (TGA) is advocating. This is exactly what the TGA was created to do – to get South African society to wake up – to “join forces” and to “go ahead.” The TGA is the “force” that you should join. So why don’t YOU do just that? Join the TGA as a member and get your friends to join the TGA, too. Start (and spearhead yourself) a new and innovative movement (under the TGA’s wing) to help save South Africa’s wildlife. It is the only way that South African society is going to “make a difference”. “Difference” won’t happen all by itself! The TGA needs people like you – so does the wildlife of Kruger National Park – people who actually understand that there is a conservation conundrum to solve – but who (maybe) need a little guidance and encouragement to understand what the problem really is; and how it can be remedied. I would welcome communicating with you further on this suggestion – if you would like to do so. And to start off with, I would like to send you a small booklet entitled “Managing Our Wildlife Heritage”. So please send me your postal address. And I congratulate you on your perspective. ← Kruger Park’s biological diversity is in serious trouble! 8.